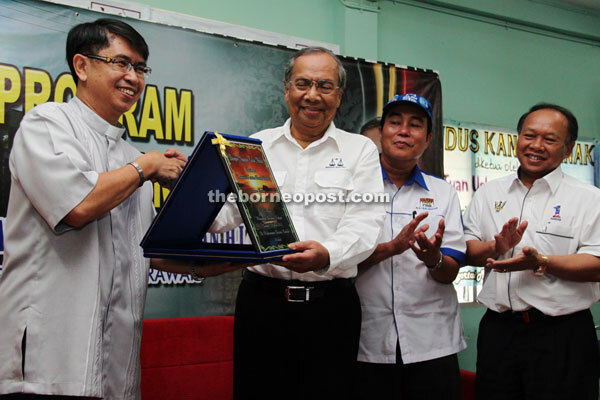 (From left) Father Joseph presents a memento to Adenan as Yussibnosh and Nansian (right) look on. 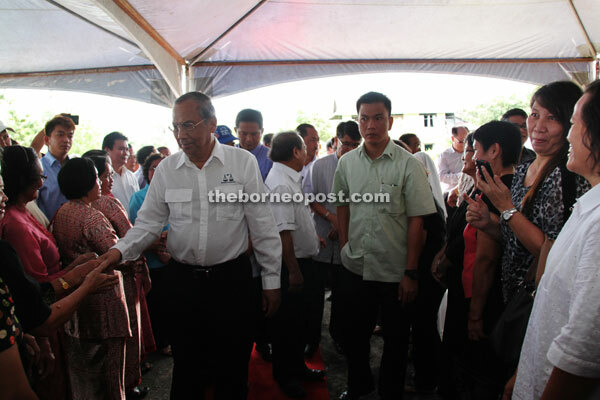 MUKAH: Chief Minister Tan Sri Datuk Amar Adenan Satem told Christians here there was no law in Sarawak that prevents them from using the term ‘Allah’ to refer to God. “There is no law in Sarawak that says you cannot use the word ‘Allah’, and I will not permit such a law in Sarawak as long as I am the Chief Minister,” he said during a meeting with the people at the Catholic Centre here yesterday. Adenan said he believed everyone is a child of God regardless of race and religion, and that God loves everyone irrespective of their faiths. He regarded ‘Allah’ or ‘Tuhan’ as the same God of many colours and there is no difference among his people. Yussibnosh (right) shakes hands with Father Joseph as others look on. Adenan greets Christians at the Catholic Centre. Thus, he called on the people to respect one another’s religion, beliefs and differences. He said there were Melanau families here where the parents are Christians while their children are Muslims, but they lived under one roof. Meanwhile, he said as chief minister he had to make sure everyone could practice their own religion in their own way without hindrance. He told Saints Peter and Paul Catholic Church Mukah parishioners that he could give 10 per cent of the things they asked for. “I cannot give all that you asked for, but have no doubt that I will never distinguish between mosques, or churches, or temples. “That is the way it ought to be. You are at liberty to practice your religion in your own way,” he pointed out, adding that such religious freedom is enshrined in the federal constitution. 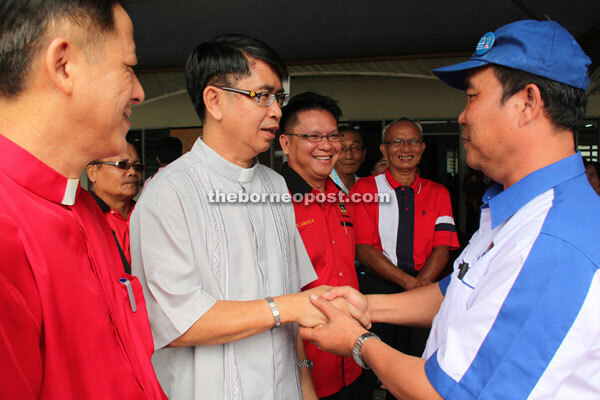 He said Sarawakians had been living in peace for hundreds of years without quarreling over religious issues, and for that people in the peninsula had a lot to learn from Sarawakians. Also present at the event were Saints Peter and Paul Catholic Church Mukah rector Reverend Father Joseph Sebastian, Assistant Minister of Community Services Datuk Peter Nansian Ngusie and BN candidate for Balingian by-election Yussibnosh Balo.